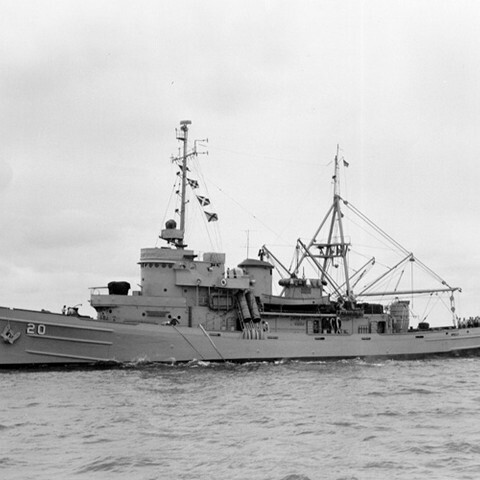 SKYLARK was laid down in July 1945 as the Navajo-class fleet tug Yustaga (ATF-165) by the Charleston Shipbuilding & Drydock Co. of Charleston, South Carolina. While under construction Yustaga was redesignated a submarine rescue ship on 11 October 1945, assigned the hull designation ASR-20 on 13 November 1945, and renamed Skylark on 5 December 1945. She was launched on 19 March 1946, sponsored by Mrs. H. C. Weatherly, and was placed in the Atlantic Reserve Fleet, berthed first at Charleston and later at New London, Connecticut, until 1 March 1951, when she was finally commissioned, Lt. Comdr. Romolo Cousins in command.